They’re right. Great things can be bad for you. But who cares when it tastes really great, right? Now matter how you look at it, you just can’t figure out what it is. Sure, the carrots are obvious, but to have the courage to eat those black stringy things is admirable. Heck, if it doesn’t smell funny and other people were eating it, just eat it. And so I did. When I went to my Japanese friend’s place for a Friday night dinner, her mom, knowing my knack for eating anything (lol) served me this braised side dish. I may have seen different colors for food, but seeing something black that isn’t from squid ink totally made me curious. All the more when I asked what it was. Her mom answered that it was simply a seaweed that’s not nori. Just a seaweed. And so I ate it without thinking and found it to be quite delicious. 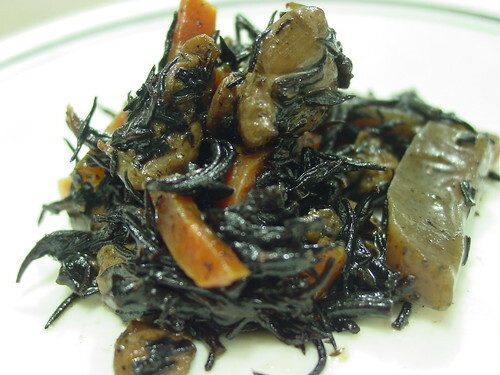 Later on in the conversation, I discovered that it was this seaweed called Hijiki. It’s a food item quite native to the Japanese and can be bought at our local Japanese grocer. It’s usually consumed braised with some shouyu and sugar, maybe mirin and sake, if it’s to your taste. I loved it so much that I brought like a tub worth home and ate it the next day on hot rice and some riceballs. What is interesting though was my discovery the other day when I thought of writing this very blog entry about Hijiki. As it turns out, this tasty hijiki, has traces of arsenic. Yup, that very poison we always see in medical dramas like House or Grey’s Anatomy. lol. The Wiki entry gave me quite a scare, but since there hasn’t been any reported Hijiki poisoning cases, it can’t be that bad. According to Wikipedia, Hijiki’s poisonous only if you consumed 4.7g per day. The regular japanese consumes around .9g. Did I say that I ate the whole tub (like a large tupperware) the next day on hot rice and some riceballs? XDDD Yeah. I’m so happy nothing happened to me, then again, if ever I go poisoned eating hijiki, that would have been the happiest last moments of my life because it really tasted good!